This graph is compiled from the Utah County Association of Realtors. This graph shows all the homes for sale in Utah County and listed by a Realtor. Each dot represents the number of homes for sale in any particular month ranging from 2009-2013. This graph does not include for sale by owner homes, some builder homes or custom homes that were not listed for sale on the MLS. We call this inventory the "Active Listings". I think this graph represents about 90% of the active Utah County Real Estate Inventory. The yearly legend is located on the right side of the graph below. If you follow the youtube link a video will appear with my latest quarterly evaluation of the current market conditions. Search the active listings in Utah County by following the "Search Homes" link above. 2013 - The 2013 Utah County active listings real estate inventory climbed higher in the 4th quarter than the 2012 inventory. It is very likely that we will have a higher inventory of homes in 2013. A large inventory of homes puts downward pressure on prices. I don't expect prices to increase very much in 2013. 2012 - This year started in an explosive way. It was like every buyer woke up in January 2012 and decided to buy a home. I realize interest rates were low but the buyer's really returned to the market. I was closing some buyer's that were getting a 3.5% interest rate on a 30 year note. It was hard to believe. In fact, from 2007 - 2011 Approximately 25% of the homes were Bank Foreclosures and another 25% of the homes were short sales. Thus, 50% of the Utah County Real Estate Market were distressed properties. In the fourth quarter of 2012 this changed. About 3% of the Utah County Real Estate Inventory were Bank Foreclosures in the 4th quarter of 2012. However, the number of short sales remains at about 25% of the market. We have changed from a buyer's market to a neutral or in some cases a seller's market. The active listings market was generally much hotter in the Northern Utah County compared to Southern Utah County. 2011 - This is the year things started to really change with the active listings. The Utah County Real Estate Inventory dropped from 3,880 homes for sale down to 3,050 homes for sale. Bargain shoppers came pouring into the Utah County real estate market. This was a nice relief for many Utah County Realtors than had stuck through the thick and thin in the market. Many buyers were buying short sales and bank foreclosures during this time period. In my opinion, the fourth quarter of 2011 was the last best buying opportunity I have ever seen. I have been selling homes since 1995 full time in Utah County. 2010 - The active listings inventory seemed to keep the same pattern as 2010. The Utah County Real Estate Inventory hit a lower high than in 2009 with only 4,300 homes for sale. Interest rates continued to drop. 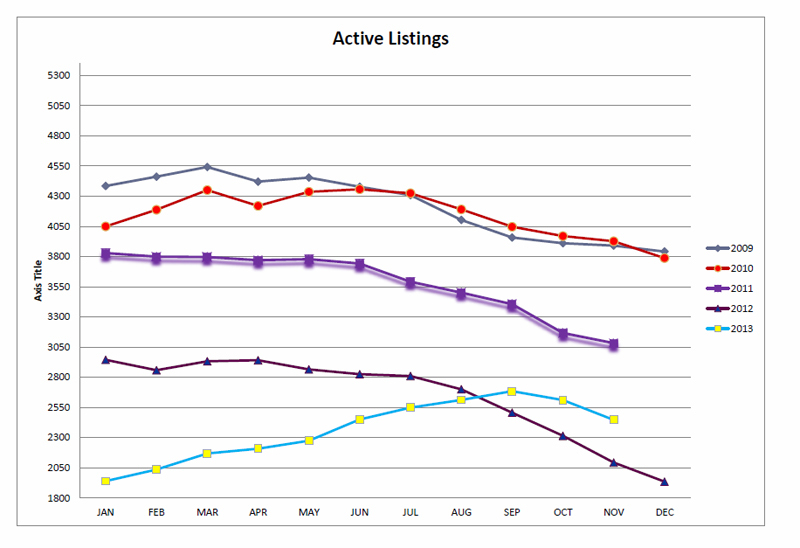 2009 - The active listings inventory started a downward trend in 2009. Some buyers started coming back to the market and buying homes again in Utah County. The amount of real estate inventory dropped from 4,550 homes to 4,050 homes for sale. Buyer's were nervous during 2009 and felt confident the bottom was not in at this time.